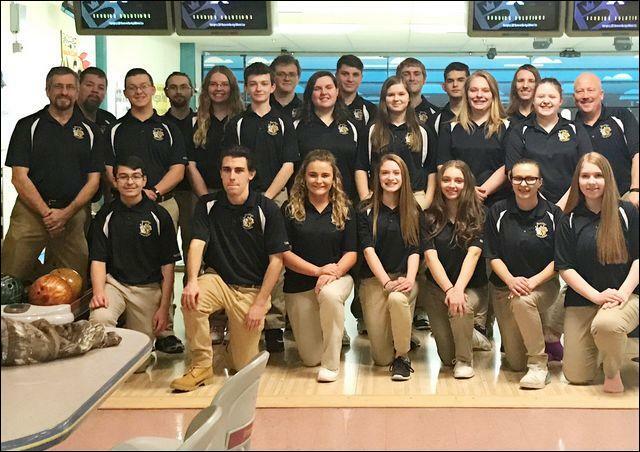 The Butler High School boys and girls bowling teams are undefeated this season and carrying winning streaks of 27 and 20 matches, respectively. All five starters on the girls teams are looking to bowl in college. BUTLER TWP — Butler High School has seen members of its girls bowling team go on to compete in college before. Megan Paul is enjoying a successful career at Lindenwood (Mo.) University, Autumn Hepler competed at Ursuline (Ohio), Brea Suchonic at Penn State-Altoona. Heather Paul competed for a year at Penn State University. But all five starters from one Golden Tornado team moving on? That's never happened. It may with this year's team. Nicole Nebel, a Golden Tornado senior, has already verbally committed to Mount Aloysius in Cresson, Pa. She is carrying a 174 average. Mercedes Belch, a senior, averages 173 and is looking at Saint Vincent College and Penn State-Altoona. Ashley McCue, a senior averaging 166, is considering CCAC. Abby Kyle, a senior averaging 160, is also looking at Saint Vincent while junior Jordyn Graham is weighing a number of possibilities, including Mount Mercy in Iowa, Mount Aloysius and Saint Vincent. Graham is averaging 160 as well. In all cases, of course, the college of choice would have to first fit academically. McCue has been bowling since age 8. Her mother, Tracy, bowled on the Butler High School club team while in high school “and told me how much fun it was,” McCue said. McCue is also looking at Slippery Rock University, which does not offer a bowling team. But a number of schools do. “Just around here, Thiel and Youngstown State have established programs,” Cupp said. “Saint Vincent and Duquesne's bowling teams are in their second year. Kyle wants to study social work and recently learned Saint Vincent offers that field of study. She's been bowling for seven years. Graham and Belch have been working part-time at Family Bowlaway for the past few months. “I love being around it and I'll be bowling throughout my lifetime,” Belch said. “Scholarship possibilities are definitely a factor for me. Belch said her grandfather, Phil Heist, got her started in the sport and a few of her friends joined the high school team, leading her in that direction. While Graham is only a junior, she is hopeful a busy July in Dallas, Texas, will open up bowling opportunities for herself. She will go through the Turbo Tech college experience and compete in three tournaments in Dallas, including the heavily-scouted Junior Gold tourney. Graham had an uncle, Jack Graham, who was once asked to turn pro. Her step-brother, Ben Hoffman, is a Butler graduate who bowled for the Tornado boys team. Jake Cookson is the only Butler male bowler to date to attempt the sport in college. He bowled briefly at Lindenwood. Jordan Reges, a junior, on the boys team, has interest in collegiate bowling and others may follow him. Reges is averaging 202 this season. Shawn Marcellus was averaging 223 before a knee injury incurred during gym class ended his season. Chris Huff is averaging 192 and Cole Thrash 185.